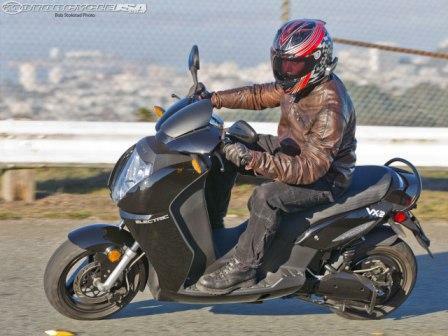 Current Motor’s Super Scooter electric motorcycle illustrates the perils and promise of the industrial engineering challenges involved with bringing green vehicles to the masses. The company’s website touts the electric vehicle as being able to traverse Manhattan four times on one charge. It has top speed of 65 mph or around 104 km/h. The Super Scooters have smartphone technology that collects and sends data to the company’s cloud IT infrastructure, letting the company know rider preferences and bike performance. Current feeds that data into its customer service system to perform remote diagnostics. The company took a systems integration approach, Digital Manufacturing Report reported, buying many components off the shelf and partnering with Dell for IT implementation, although the power train, electronics and software are proprietary. Still, its vaunted range is only 50 miles, and its low $9,995 sticker price is more expensive than at least four brand new 2012 models offered by legendary Italian motorcycle manufacturer Moto Guzzi. While obviously adequate for in-town trips and clearly cheap to operate, motorcyclists who use their bikes for longer rides will continue to shy away from electric vehicles.